S is for the flagships, A is the mid tier, M is the entry level - this appears to be the new SAMsung order of things (spot the N in there for the Note?). The Ms themselves are very tightly spaced - we have the Galaxy M20 today to see how it compares to the M10 from last week and whether it will help Samsung's aggressive charge in the affordable segment. 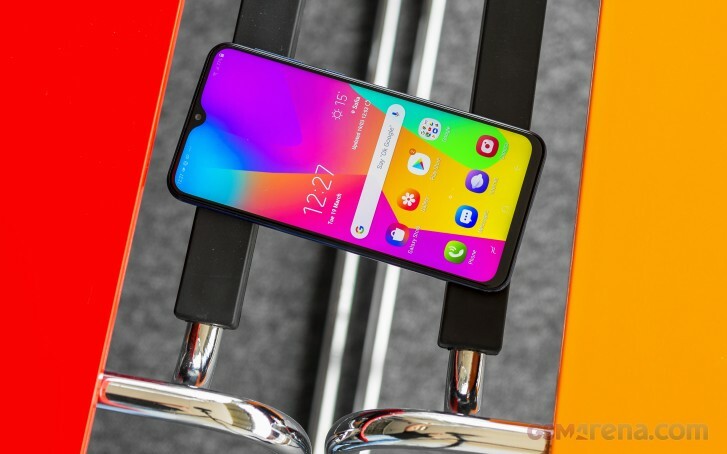 Going over the specs, the Galaxy M20 is already looking a lot nicer than the M10 - a snappier Exynos, a higher-res display, a ton more battery, and a fingerprint sensor where there was none. Add to that a more reasonable 3/32GB base model (vs. the M10's limiting 2GB/16GB), more megapixels on the selfie cam, and some fast charging, and it's starting to become evident that the savings are not quite worth going for the M10. Body: 156.4x74.5x8.8mm, 186g, glass front, plastic back and sides. Screen: 6.3" PLS TFT (IPS), 19.5:9 aspect, 1080x2340px resolution, 409 ppi. Chipset: Exynos 7904 (14nm) chipset: octa-core CPU (2x1.8GHz Cortex-A73 + 6x1.6GHz Cortex-A53); Mali-G71 MP2 GPU. Memory: 3/4GB RAM, 32/64GB built-in storage, dedicated microSD slot. OS: Android 8.1 Oreo; Samsung Experience 9.5. Rear camera: Primary: 13MP, 1/3.1", 1.12µm; 31mm, f/1.9, PDAF. Secondary: 5MP, 1/6", 1.12µm; 12mm ultra-wide, f/2.2, fixed focus; LED flash; 1080p@30 video recording. Front camera: 8MP f/2.0; 1080p@30fps video recording. Battery: 5,000mAh; Samsung Adaptive Fast Charging (QC2.0 compliant). Connectivity: Dual-SIM; LTE Cat.12 (600Mbps) download / Cat.6 upload (50Mbps), Wi-Fi b/g/n, GPS; Bluetooth 5.0, A2DP, LE, USB-C 2.0. Misc: Rear-mounted fingerprint reader, down-firing loudspeaker. It's not all top marks for the Samsung Galaxy M20, however, and you'll need to look at the M30 for things like an AMOLED display and 4K video recording (with the same chipset as on the M20, mind you), plus less essential stuff along the lines of a depth camera on the back or even higher-res selfies. 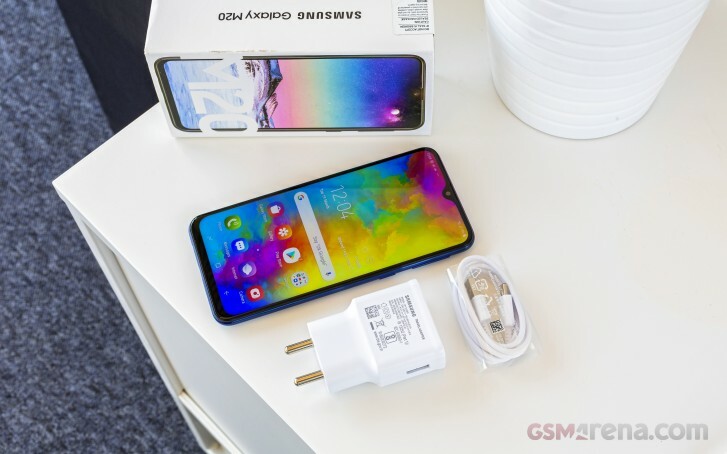 Yet, there are hardly any glaring omissions on the Galaxy M20 as it is and that's typically the solid foundation on which great entry-level phones are built. And there's some good news waiting inside the box too. That's the charger we're talking about. While the Samsung Adaptive FastCharge standard isn't the most capable, or recent - it's been around since the Galaxy S5 and is only QuickCharge 2.0 compliant, the adapter inside the box is the same you'll find bundled with the high-flying Galaxy S10. It's rated at 9V/1.67A and 5V/2A so with its 15W maximum output it's three times as powerful as the basic 5V/1A unit inside the Galaxy M10's box. There's also a USB-A to USB-C cable in the package - the M20 does have a USB-C port like key rivals and, you guessed it, unlike the M10 with its old-school microUSB 2.0. There are still plenty of similarities that run in the family and we'll talk more about those on the next page. Oh, don't worry, I'm aware. I was only trying to annoy the other guy. Samsung has lost over half of its global smartphone market share in the past 5 years. The phone is so far good. but the worse things in this phone is the camera.